choosing the correct breakdown cover for your car is an important decision. having good cover makes all the difference when you and your family are stuck on the side of the motorway or in bad weather in some remote spot, or you're on your way to an all-important business meeting. are you going to be helped efficiently and professionally? will the person who attends your breakdown know what they're doing? There are a huge number of types of car breakdown cover to choose from, provided by organisations with a motoring heritage, insurance companies, major retail brands and other sources. But how do you find the best for you? 1. Does the scheme cover the vehicle or the driver? Even if you have just one car, you'll appreciate breakdown cover that offers the flexibility of covering you in any car you drive, even if it is one you have borrowed or hired. Similarly, if you change your car, you don't have to bother to inform your breakdown service. 2. Can I cover my partner or my family? 3. What happens to my vehicle if it breaks down? A prompt, helpful, professional call centre can make all the difference at a stressful time. They should take your details and arrange for a qualified mechanic to be with you as soon as possible. Some call centres will even keep you informed by text message as to when help is expected to arrive. 4. What happens if it can't be fixed? Now's the time to look at the recovery cover. You may find that under your recovery policy your vehicle can only be towed to the nearest approved garage, or to your home if you are not far away - (the distance will be stated in the cover). However, with the schemes that offer more comprehensive cover you can request a recovery to any destination of your choice, irrespective of how far away that is. 5. Does it include help at your home as well as at the roadside? 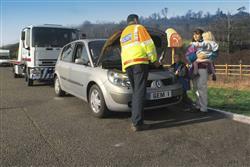 Many breakdowns happen outside motorists' homes - often on freezing cold mornings, when you need to be at work or take the children to school. And, because this is a high-risk location for breakdowns, many low-cost breakdown services only cover breakdowns more than a certain distance from your home. 6. What happens to me and my passengers if my vehicle breaks down? 7. Will my breakdown policy include overnight accommodation? If you travel long distances - for business or pleasure - you may want to check that your breakdown and recovery cover will provide you and your passengers with accommodation if you get stuck overnight. 8. How do I tell how good the breakdown people are? Let's face it, one advertiser or web site owner's claim is as good as another. You need to know about the actual experiences and testimonials of real people. Has the breakdown provider won any awards recently? Customers' or readers' awards are generally more valuable than journalists' reviews or industry awards. 9. Is it worth paying a little extra? It depends on how much your time is worth. A better performing breakdown provider will get to you quicker and will more likely fix the problem at the roadside. If your chosen provider is covering your family car, paying a little extra for a well-reviewed service should get you safely back on the road more quickly. 10. What kinds of vehicles are covered? If you drive a car 100% of the time, then almost any breakdown policy will give you the basic cover you need. But what about your caravan, trailer, motorbike or even small van? Check carefully that you don't have to pay extra - or even simply, that cover for other kinds of vehicles is available.